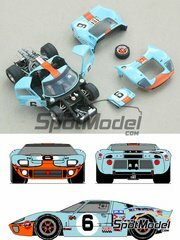 Their amazing products stand out for their high quality and maximum realism, as well as the refined packaging work. 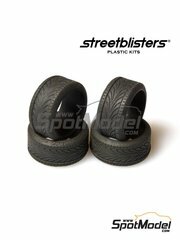 StreetBlisters decided to trust Spotmodel for the global launch of their products. 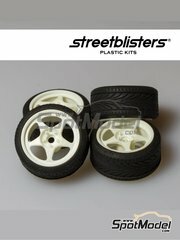 Do you want to be the first one in the world to have them at your workbench? 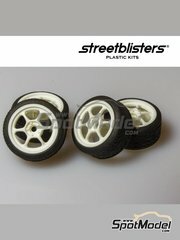 Set of four plastic rims, four rubber tyres and decals set. They are equivalent to a 16-inch rim. 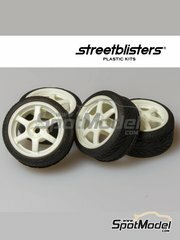 The diameter of the rim is 19mm, the diameter of the tire is 22.5mm, and the width of the set is 11mm. 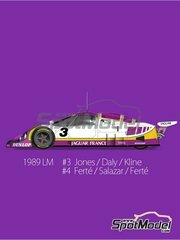 The decals are fantastically printed by Cartograf. 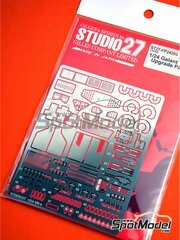 Photo-etched parts, belt fabric, and two small white metal parts for belt locks make up this Studio27 detail-up set for use in the Mitsubishi Galant VR-4 kits by Hasegawa. 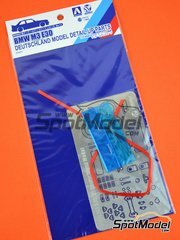 Set of photo-etched parts, antennas and harnesses fabric, specifically designed by Aoshima for their BMW M3 E30 kit. 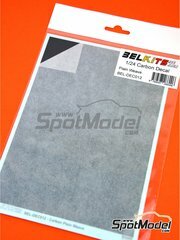 Decal for recreating carbon fibers with diagonal patterns, printed by Cartograf. 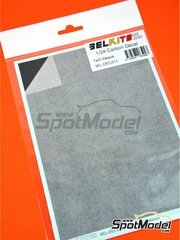 Decal for recreating carbon fibers with rectangular patterns, printed by Cartograf. 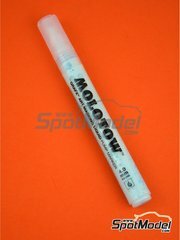 Molotow art masking liquid 4MM is a rechargeable masking pen with 4mm interchangeable tips. 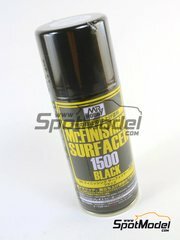 It contains an ink composed of masking liquid that allows to create a film to protect / mask. It dries very fast so the film that is created with the liquid masking allows us to continue painting on the protected area. Once dried for 15-20 min, we can now remove it with the finger or with a rubber. 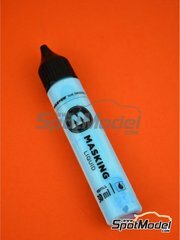 30ml refill of liquid mask for use with either airbrush or Molotow rechargeable markers. 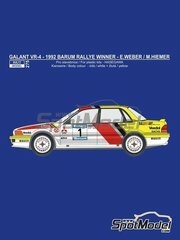 Decal decoration for the Hasegawa Mitsubishi Galant VR-4 kit as it raced in 1992 in Belgium and Czech Republic. 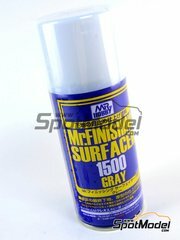 Fine grain grey primer in spray, just as easy as shake and paint. 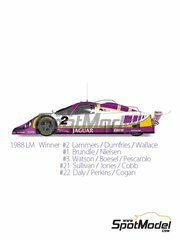 Once dry, the resultant surface admits every kind of modeling paint. 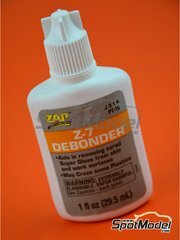 Fine primer designed to achieve greater and better paint adhesion to the surface of your models. It is served in spray can containing 170 ml of product. 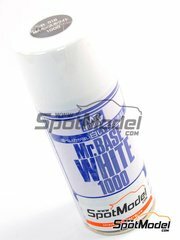 Mr Base White 1000 is the white basecoat or primer paint / fine surfacer of the Mr. Hobby line. 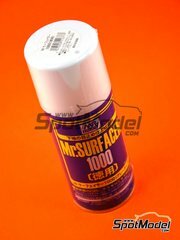 The 1000 signifies the particle size in the Mr. Hobby line, with 1000 being a mid level coating. Due to the fine particle size of Mr. Base White 1000, the paint can be applied via air brush, or brushed on with fine disposable brushes (microbrush) or paint brushes. 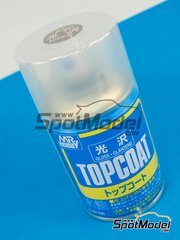 Gloss varnish spray, a classic in Mr Hobby's catalog. Includes 86ml of product. 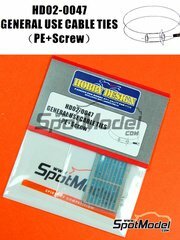 Some very thin photoetched parts along with some tiny screws made these cable ties, used in real life vehicles to hold all kinds of cables, water pipes or even exhaust pipes. 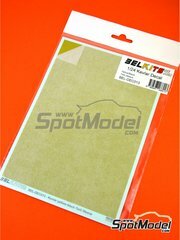 Seasoned modelers won't have any problems for using them in their 1/12 and 1/20 scale model kits, but we do recommend to use a good set of tweezers. The results are incredibly good. 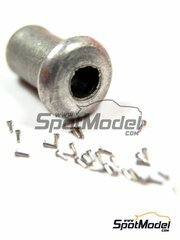 Bag with 40 rivets measuring 0.75mm diameter, made in turned metal.